"I was arguing with my friend how big the files are of 8K movies. Anyone know how large would the file be if the movie would be 100 minutes long?" 8K UHD video, with the resolution of 7680x4320p, has 4 times higher resolution than 4K UHD video and several times larger size than 4K, as well. It's much easier to find out the 4K video size, since 4K UHD video goes viral nowadays. Yet, it's a total different story for 8K UHD video size, for 8K video resource is quite scarce. Fortunately, there is always a way. We access to an enormous amount of information and eventually dig out something useful for you. How Big is 1Min/Hr of 8K Video with H264/HEVC Codec? As you can see, the 8K video file size is badly large in size even the currently most efficient video codec HEVC can't effectively compress 8K video size. Neither Blu-ray disc nor Internt network can bear such enormous file size. Thus, 8K video format can't be widely used unless it's forced to whopping reduce bit rates. But that means it comes at the heavy price of video quality. You might wonder: though the 8K video resource is limited on Blu-ray disc or Internet, it's an excellent choice to use 8K for propaganda viewing? Yes, it sounds great. However, as for most ordinary users, the 8K video decoding and playback are tough to solve, degree of difficulty equal to crack "top secret". Why Is It So Hard to Decode and Play 8K 4320p Video? Firstly, the increase of resolution brings greater pressure on video decoding. You know the peak computation burden of 4K HEVC video reaches 400~500GOPS. As for the 8K HEVC video, the computation burden would be multiplied several times. Secondly, this high-demanding computation burden can hardly be handled by CPU in video software decoding. It might miss frames or certain datas during the sofware decoding. How about GPU hardware decoding? Not supported so far. Irrespective of Nvidia PureVideo, AMD UVD or Intel QSV, they all lack the support for 8K video hardware decoding. Thirdly, there is almost no 8K Blu-ray player (hardware) or set-top box in the current market. Therefore, you'd better check if your hardware device supports 8K 4320p UHD video decoding and playback before striving to get 8K video resource. 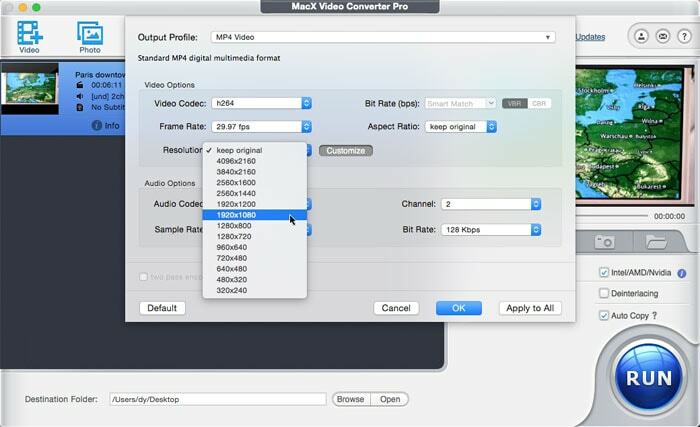 MacX Video Converter Pro, which can hardware process 8K video to 4K/1080p/720p with any codec at highest possible quality. 1. Downscale 8K 4320p to 4K 2160p, 1080p, 720p formatted by HEVC, H264, MPEG-4, VP8, DivX, MP4, MOV, MKV, etc. any codec/format. 2. Optimized video transcoding engine and High Quality Engine ensures you an output video file with 98% quality reserved. 3. GPU hardware acceleration techs (Nvidia/Intel QSV/AMD) to hardware decode/encode 8K video at 5-8X faster speed. 4. Reduce 8K, 4K ultra HD, Full HD 1080P, HD 720P by 50%-70% via parameter adjusting (bit rate/frame rate) and video editing (trim/crop). 5. Convert 8K video to iPhone X, iPhone 8/Plus/7/6s/6, iPad Pro, Android, Google Pixel series, Microsoft devices, etc. (410+ profiles) for smooth playback. Before you carry out the 8K video compression, have a check on your hardware configurations to see if it supports GPU hardware acceleration techs. This program supports up to three types of HW acceleration techs: Intel QSV, Nvidia and AMD. It will automatically activate and fully use them to speed up 8K video processing up to 5-8X faster if the hardware configurations meet the entry-level requirements (Check HW acceleration full guide to see if your computer supports HW acceleration). Step 1: Import 8K Video Files. Free download and launch this 8K video compressor. Followed by a click on "Add Video" icon to load the 8K Ultra HD video files. Or simply drag and drop the 8K video into this program. Step 2: Select the Compression Codec. You're suggested to choose "MP4 Video (HEVC)" as compression codec, which can shrink 8K video with 50%+ size off while keeping the same level of quality. Of course, there are more video codecs available for you to choose from including H264, MPEG-4, MPEG-2, VP8, DivX, etc. if your playback device doesn't support HEVC codec and video compatibility is more important to you. Tap the settings icon to enter the video parameter adjustment zone, where you can compress and downscale 8K to 4K/2K/1080p/720p resolution, lower bit rate 20%-50% to further downsize 8K video file and adjust 8K frame rate from 60FPS to 30FPS, etc. This 8K UHD video compression process resizes 8K files at the cost of certain quality loss. The degree of quality loss depends on the adjustment range you've done. Hit the "Edit" icon and you'll be directed to the 8K video editing interface, where you're allowed to use "trim" feature to freely set up video Start/End time to shorten 8K video length and apply "crop" feature to cut off the unwanted borders from video image. Tap "RUN" button and this video shrinker will start to reduce 8K UHD video size at hardware accelerated speed. When it's done, you can eventually import 8K video to your iPhone iPad, Android or smart TV for playback without video compatibility or hardware configuration issues. 8K video can't play on your device? 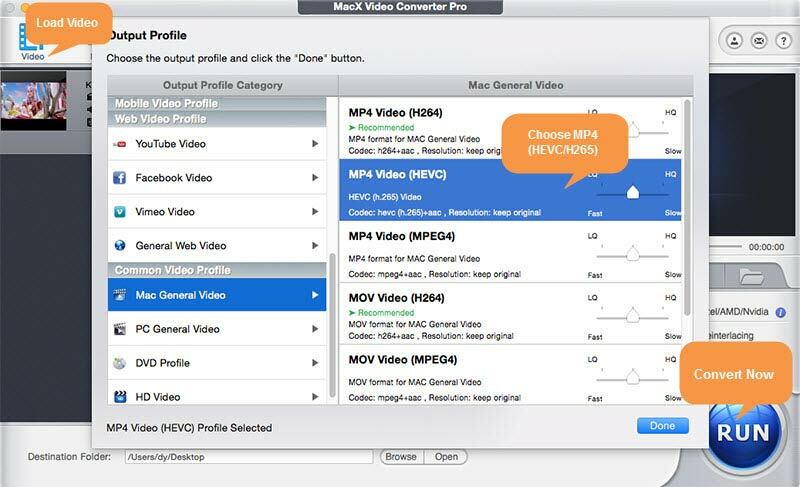 Try MacX Video Converter Pro to convert and shrink 8K video to 4K/2K/1080p/720p video in HEVC, H264, MPEG-4, MP4, MOV, MKV, etc. video codec and formats so as to playback 8K video on iPhone iPad Android, Microsoft, Google device, Xbox One, PS4, etc. Roundup of free video resizer for you to shrink video. This guide shows you how to make video file smaller.